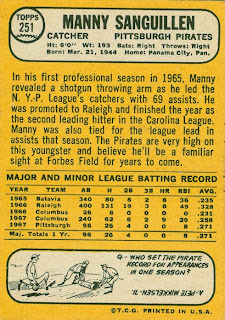 Manny had a card in 1968, but not major-league playing time. 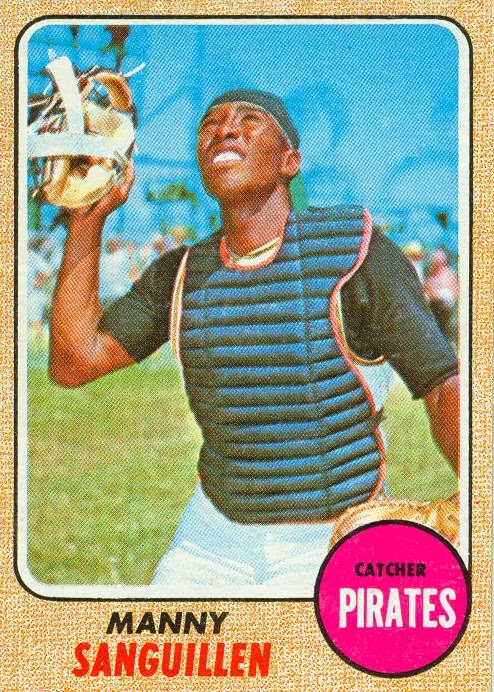 He spent the entire season in the minors, then returned in 1969 as the starting catcher. 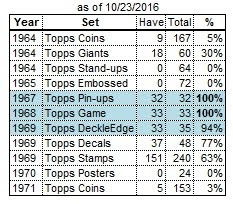 Sanguillen was signed by the Pirates in late 1964, then played 2 seasons in A ball before jumping up to triple-A for 1967. When Pirates' regular catcher Jerry May went down with an injury in late July, Sanguillen was called up and started 14 of the next 24 games behind the plate, alternating with aging veteran Jim Pagliaroni. When May returned in mid-August, Pags was shelved for the remainder of the season, with Sanguillen backing up May. Manny spent the entire 1968 season back in triple-A "getting his playing time", while journeymen types like Chris Cannizzaro and Gary Kolb were retained as May's backups. 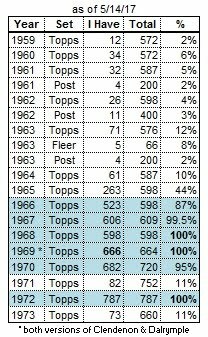 Sanguillen returned in 1969, splitting the catching assignments with May for awhile, but by late-May Manny had taken over, ending up with 107 starts to Jerry's 50 starts. 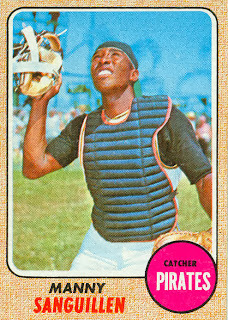 Except for the first half of 1973 (when Manny started 53 of the first 54 games in right field, in an attempt to replace the late Roberto Clemente), Sanguillen was the Pirates' regular catcher until September 1976, when he gave way to Duffy Dyer and Ed Ott. Manny was an all-star in '71, '72, and '75, and hit a career-high 12 home runs in 1973. He also collected 11 hits in the 1971 World Series, good for a .379 batting average. After the 1976 season, he was traded to the Athletics for manager (yes, manager) Chuck Tanner. 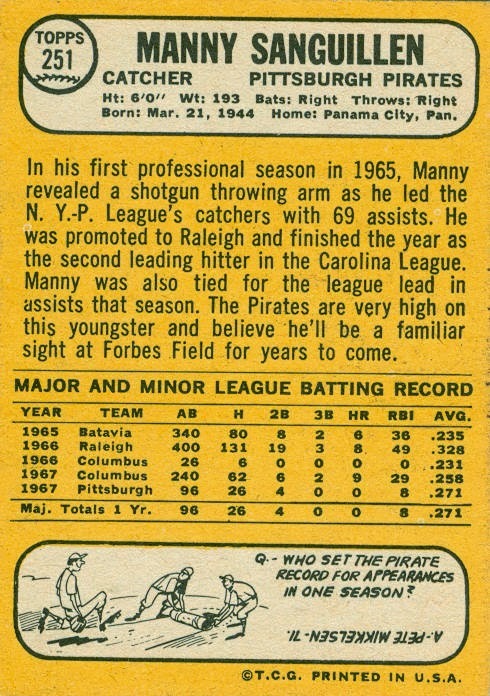 Manny returned to Pittsburgh after only one season in Oakland, with the Pirates using him as a pinch-hitter and occasional backup first baseman for the next 3 seasons. Traded to the Indians after the 1980 season, he was released in spring training the following year. Manny sat out the 1981 season, then played in the Mexican League in 1982.